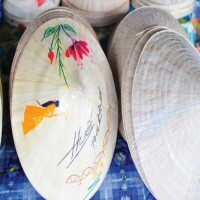 Published: 09:12 Thursday - May 27, 2010 Hat-making village Phu Cam (also Phuoc Vinh) lies on the southern bank of the An Cuu River in the centre of the former imperial capital of Hue. It`s a village famous for its traditional way of making conical hats for hundreds of years. What can make music, hold water and inspire dozens or legends in Vietnam`s Central Highlands, the gourd is a godsend. Fans made of paper, silk, and wood are a cultural feature only found in Asia.